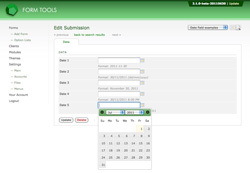 The screenshot to the right shows a few examples of date fields, and how the calendar looks when a field is clicked on. 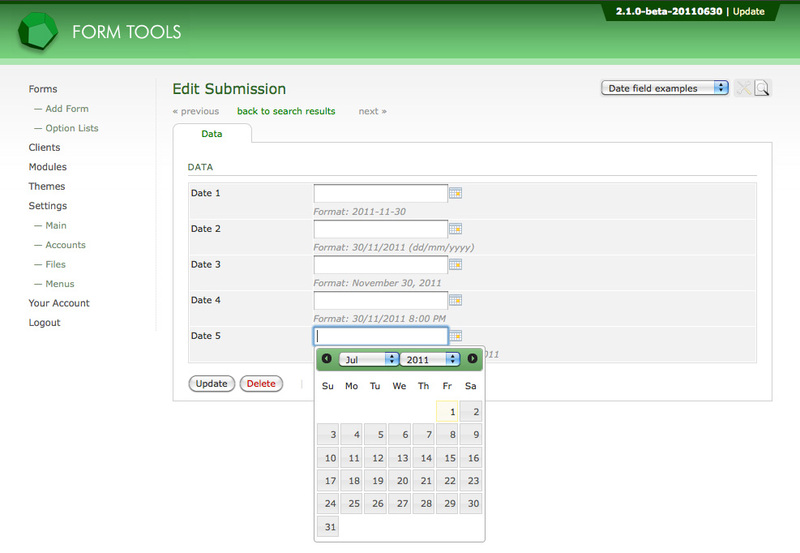 As per the comments on each field, you can customize the date format, depending on what you need. You can either have a date or datetime (which is just what it sounds like: the date plus time!). As with all field types, click the Edit icon on the Edit Form » Fields page and go to the second tab to see all the custom settings for that field type. Here's what each of the field type settings mean. Custom Date Format: this lets you control how the date gets displayed. Behind the scenes, dates are always stored as full datetimes in a specific format, so you can change the custom date format for any field at any time and not lose any data. Apply Timezone Offset: this setting lets you take into account the user accounts timezone offset. Note: if the field is being displayed outside of the context of a user account (e.g. via the API in your own pages), no timezone is applicable so it will output whatever date is stored in the database without any offset. Field Comments: this setting appears for all field types. It lets you add some comments to appear underneath the field, to help explain what the field is about. Date fields are also unique in other ways. On the main Submission Listing page which displays all your form submissions, if one of your date fields is marked as "searchable" in the View, it will appear as an option in the search dropdown. When you select it there, a new search bar will appear to let the user search by date / date range. This always occurs for any date fields, just like the core Submission Date and Last Modified date fields.